Someone had their first smile this week...and we are all so smiling because its GORGEOUS and finally feels like fall outside! We went to ISC to get out some energy!! Travis left to go out of town Friday, which meant Bennett helped me tutor the Chinese kids all weekend! He was great Friday night, but cried during all 3 lessons on Saturday night (one student said: "Do you have a cat?" because that is apparently what Bennett crying sounds like on headphones in China, ha!). Lucas was more interesting in bringing me sticks than playing soccer! After soccer, we went to Mackenzie's birthday party! Lucas's favorite part of the party was playing with all of their toys. And Ella found Mackenzie's Peppa Pig stuffed animal and dragged it around everywhere with her. 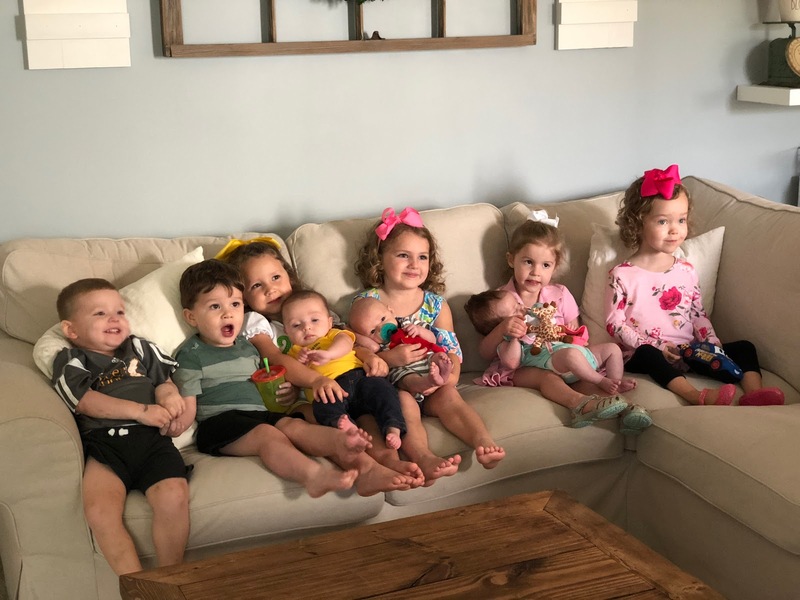 Bennett hung out with his baby friends! Of course Chelsea, Mackenzie's mom, had lots of fun activities for the kids to do! First, they painted a picture frame. And then they made flower wreaths! So cute. When we came home, we made some pumpkin cookies. No recipe for you...these are the "fancy" break-n-bake ones! Ella made me get them! We had another birthday party! Ella has so many friends with birthdays this time of year. 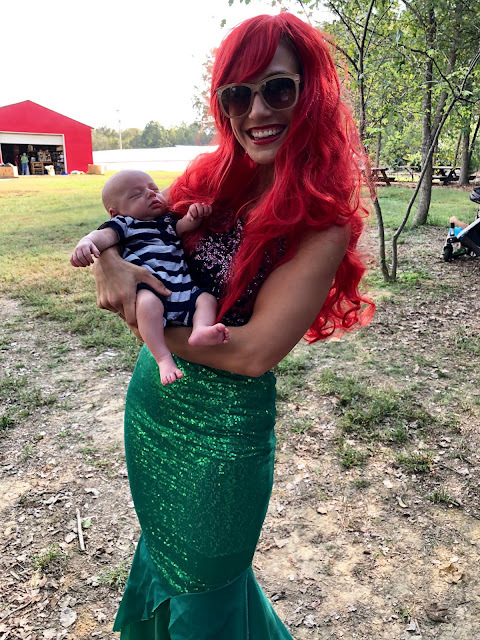 Anyway, this was her friend, Alevia's party and it was at a local pumpkin patch. Ariel made an appearance! This was Bennett's first mermaid sighting!!! Lucas had fun on a nearby swing that he almost fell off of about 16 times. Ella wanted to take home all of the pumpkins, but it was so hot and we weren't in our proper pumpkin picking clothes, so I told her we would have to come back another day! Travis made it home, thank GOD! I told him I hope he had a good time because he is never leaving me on the weekend with 3 kids (and 2 birthday parties!) again, haha! Once we got Ella off to preschool, we made a run to Trader Joe's! I always call the samples they have "treats," and Lucas always gobbles them up. He enjoyed this spaghetti squash casserole so much that I actually bought it! He thinks it's a treat!! The cashier handed me the receipt while saying "Do you want a sticker?" to Lucas, so Lucas thought the receipt was a sticker! He wouldn't let me have his "sticker" and held onto it the whole ride home! Bennett also smiled for the first time on Monday!!!! I tried to get a picture, but of course he is stubborn! All 3 of my babies when they started smiling!! ...to deliver to my high risk doctor's office! The main doctor who gave Bennett the 3 transfusions in utero was not there, so we may go back again to see him. But my favorite ultrasound tech and another doctor who assisted with all 3 IUTs were there and they LOVED Bennett!! Someone is getting super possessive over the car transporter at his sister's dance lesson. It is legit his favorite toy right now, and the only way I can get him to go to Ella's dance lesson each week with us! He also played basketball with the big kids at church, while Ella was in her little class! Also Wednesday night was Bunco!! I was one loss away from being the biggest loser. So much fun always with these ladies! I came home to Bennett squished into his premie pajamas (he's finally outgrown them!). Oh Trav. Bless. We had another hurricane coming our way!!! Ella was out of school again, so we had a slow morning and got lots done around the house! Both kids wanted to dust, strangely! And Bennett helped me vacuum! I'm just glad we didn't lose power, like some of our friends! It flickered for a little bit, but managed to stay on, thank goodness! I felt like this hurricane was a little scarier than Florence a month ago! I hope we are done with hurricanes for now! !